This is the second (2nd) announcement of our next conference and annual general assembly to be celebrated in Isili (Sardinia, Italy) from June 28th to July 3rd 2005 under the title “Lights and shadows in cultural astronomy”. 1) Dates and General Scheduling: We have kept the timetable of the 1st announcement and the delegates are expected to arrive in Sardinia during Tuesday June 28th (first night included in the hotel pack) and to leave on Monday July 4th (Sunday the 3rd is the last night). 250 Euros for accompanying person in double room. For registrations later than this date, an extra charge of 50 Euros should be considered. Please send via e-mail the confirmation of your Bank Transfer (if possible scanning the receipt in low resolution). 3) Lodging and Meals: We have been very successful in the pre-registration process and, consequently, three hotels of similar category (2 star), Il Sole, Cardellino and Pioppo in Isili (all within walking distance of conference venue) plus the excellent Dedoni Hotel in Gergei (5 Km. south of Isili) have been selected (please see enclosed map). Mini-buses to the conference venue will leave every morning from Hotel Dedoni and will come back to Gergei after the end of the sessions. 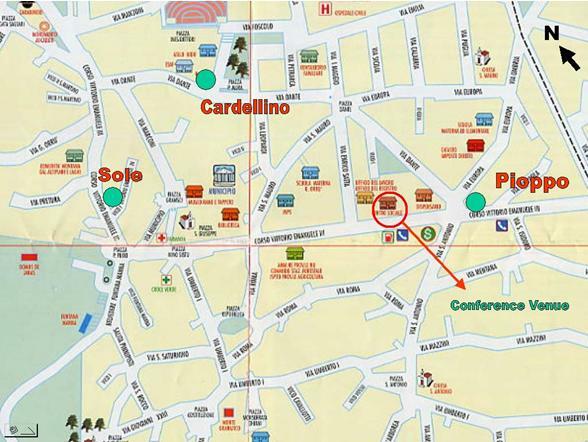 Lunch will be served every day for all delegates in Hotel Cardellino. Dinner and breakfast will be served in the respective hotels. In an enclosing file, you will find the preliminary hotel distribution. Please check that you are correctly considered and take into account that this might not be the definitive one. 4) The venue: The conference will be held in the Social Hall of the village of Isili (see map). This is a small typical interior Sardinian town located some 70 Km. to the north of Cagliari, Sardinia capital. 5) To and from Isili: The local organizers are willing to provide transport for most of the delegates from both Cagliari harbour or airport. Dates of arrival and departure should be known well in advance to arrange this. Hence, once you know the date and time of your arrival, please let us know as soon as possible. For those arriving to other airports (e.g. Alghero or Olbia) or harbours (e.g. Olbia or Golfo Aranci) other solutions will have to be worked out and we can not guarantee transport from these far away spots. However, a possibility might exist to pick you at the train station of Oristano (some 65 Km. west of Isili). To reach this you must take trains either at Sassari (if arriving at Alghero) or Olbia train stations. Please let us know if this solution suits you. For those coming from Italy or mid-Europe, it might be a good idea to come with your own car. Fast-ferries travel daily from the harbour of Civitavecchia to Golfo Aranci. The rest of the travel, crossing Sardinia, is very pleasant and you can visit the marvellous prehistoric monuments near Arzarchena or Nuoro on your way to Isili. 6) Excursions: Two excursions are finally planned within the conference (see preliminary programme enclosed). These we expect will be free of charge if the negotiation with the island government are fruitful. If not, a small fee would be charged. An afternoon excursion to the surroundings of Isili is planned for June 30th and a full day excursion will be arranged for Saturday 2nd to the northwest of the Island. 7) Abstract: Please send the full title and abstract of your presentation (one page in Word, character size 12, Times New Roman, or similar) to Mauro Peppino Zedda and Juan Antonio Belmonte as soon as possible and not later than April 15 so that the LOC will have time to edit the Abstract booklet in time. 8) Preliminary programme: Please find enclosed the preliminary programme of the conference (minor changes are expected). Please take into account that any presentation must include, at least, 2 minutes to settle the computer or slide projector and 5 minutes for questions. As you can see, the programme is completely full and compact. Consequently, any new registration will have to be presented as a poster. 9) Proceedings: This will be published by the LOC, hopefully very soon after the conference, so we strongly recommend you to have a preliminary version of your paper in “Word” (12 size, Times New Roman) at the time of the conference. Please follow the instructions of the journal Archaeoastronomy JAC to edit your paper. We WILL NOT wait for anybody because, otherwise, we can loose the financial support. Twelve (12) pages will be allotted to Invited Speakers and the Round Table presentations, and eight (8) pages for the rest of contributions, including figures. With this we will already have a volume of some 400 pages. The presentation at the conference does not guarantee the publication in the proceedings. 10) Further information: If you have any additional question or comment, please do not hesitate to contact both of us at the e-mail addresses indicated below. A 3rd announcement is expected for May when the registration process will be ended.